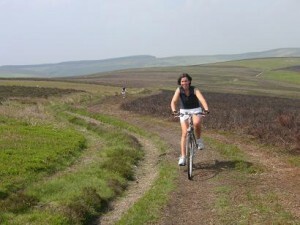 Kington is wonderfully situated for outdoor pursuits. 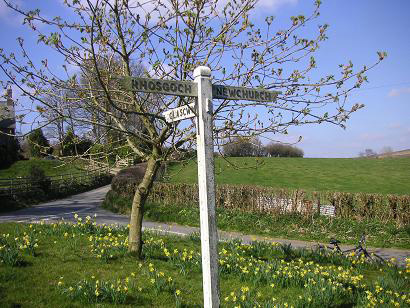 Walkers will find it a perfect area to explore; riders of both horses and bikes will find a wonderful network of bridleways enabling you to explore the hills of the Welsh Marches, often meeting no one else for hours on end. 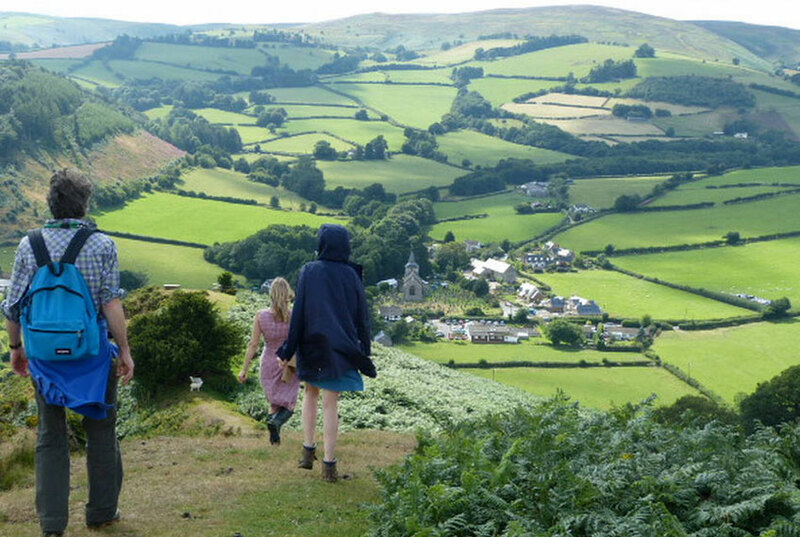 Kington really is an ideal centre if you’re keen on hiking. Turn left out of our front door, and within minutes you’ll find yourself climbing the eastern flank of Hergest Ridge, which resembles a 4-mile-long stranded whale. Climb for nearly an hour, and you’ll find yourself at 1400ft above sea level, with truly spectacular views in all direction. That’s on a fine day. At other times, you may find yourself being blasted by a fierce westerly wind and/or lashed by freezing rain. Hard luck! Grit your teeth, and head on down the other side to Gladestry, where a village pub awaits you (open Wed-Sun lunchtimes). There are plenty of splendid other walks based in Kington, ranging from one-hour strolls round town to a 30-mile trek (the Mortimer Trail) through the beautiful hills of the border country to Ludlow: the Kington tourist office will be happy to give you details of all of these. Offa’s Dyke Path: Kington is also right on the Offa’s Dyke Path, a long-distance footpath running north-south along the ancient border of Wales and England. This beautiful walk follows the actual Offa’s Dyke for much of its course, a historic defensive earthwork built in the 9th century by Offa, King of the Mercians, to keep out marauding Welshmen. In most places the old dyke is clearly visible as such, and it is a rather stirring experience to walk right beside or even along the top of this ancient earthwork. Not surprisingly, Offa’s Dyke Path attracts hikers from all over the world, but it is never crowded. Kington is about halfway along the footpath (total length around 180 miles), and is one of the recognised overnight stops. Church House is the first B&B you reach when arriving in Kington as you head north up the Path. Here at Church House we understand walkers, and our guests need not feel squeamish about arriving on our doorstep in filthy boots and sodden clothes. We’ve seen it all before! Boots and clothes dry out overnight with the help of the Aga in our kitchen. If necessary we can wash and dry your kit in our machine. Most people who’ve done any mountain biking around here agree that it is the best anywhere. 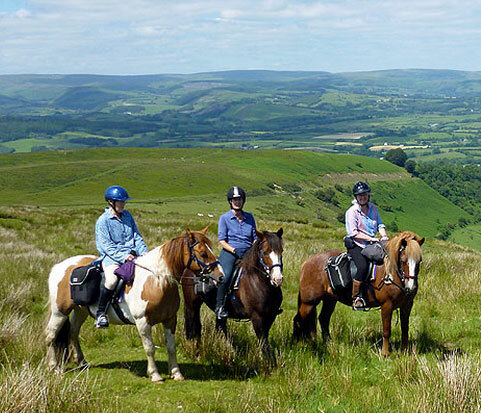 Look what the area offers you: stunning scenery, quiet public roads, hills up to 2000 feet and more, plenty of bridlepaths – and virtually no one else doing it! It is very rare to meet anyone else out on those hills. Want to really get away from people? Get on your bike and head west. 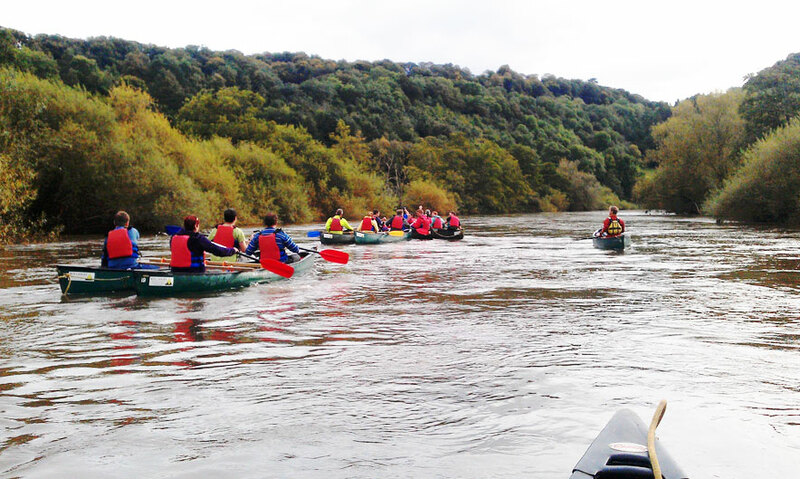 Canoeing: The river Wye is only a few miles away from Kington. On a warm summer’s day, there can be few things more enjoyable than sitting in a canoe with one’s family or friends and a picnic basket, drifting lazily down this most beautiful of England’s rivers. You don’t need to own a canoe or even have any experience: just drive to Glasbury (beyond Hay-on-Wye) and rent a suitable boat, and head off downstream. A few hours of gentle progress will bring you to Hay, where you simply ring up the hire company and ask for a lift back to your car. Totally painless! Just ring Wye Valley Canoes at 01497 – 847213 to book your canoe. Tip: unless you’re experienced, or very energetic, ask for a ‘Canadian’ canoe (which will hold several people, as well as your picnic), and not the one-man kayaks – which tend to go round in circles. A Canadian is far more stable, far easier to steer in a straight line, and more sociable. 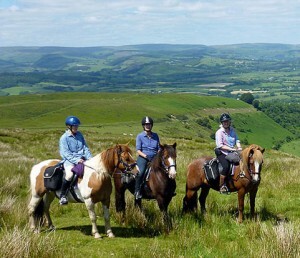 Riding: It’s a great area here also for horse riding. There are several establishments around here where you can go trekking on their horses, and we occasionally welcome overnight guests who arrive here on horseback. They turn their steeds out into the field just below our house. Not a problem! Golf: Many people come to visit Kington just for the golf. Kington Golf Course is straight up the hill from us – right on the top of Bradnor Hill. This makes it the highest golf club in England, at 1100 feet above sea level. (Interesting on a windy day!) The club has the reputation of being very informal. Go-Karting: Yes, we know this doesn’t fall into the same ‘hearty’ category as the activities listed above – but it’s terrific fun, and there is a go-kart track just a few miles away in the most stunning position. The place is called Kinsham Raceway, (tel. 01544 – 267006). There’s another go-kart track near Weobley (a few miles south-east of us) which caters for children as well as grown-ups. The tel. no. for this one is 01544 – 318334. Motorcycling: Yes, we know about biking, too. Kington is a springboard for some great rides along fast but winding roads through the Cambrian mountains to the Welsh coast. On summer Sundays, fleets of bikers appear from the Midlands en route to the sea. Come and stay at Church House the night before, and beat the rush! Flying: About 7 miles east of Kington is Shobdon Airfield, where there is a thriving flying club. You can learn to fly (fixed-wing and helicopters), glide and paraglide here. There are gentler pursuits available in Kington, too. For garden lovers: The world-famous Hergest Croft Garden is just a few hundred yards from our house. 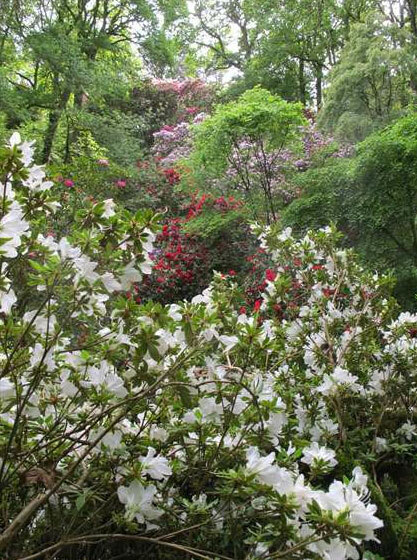 50 acres of gardens and woodland, with over 4000 rare shrubs, giant rhododendrons and many exotic species. Westonbury Mill Water Gardens is an intriguing and eccentric garden open every day April to end September with some wonderful follies including the world’s largest water-powered cuckoo clock. The gardens also have an excellent café. North Herefordshire is packed full of excellent gardens open for the National Garden Scheme. For animal lovers: The Small Breeds Farm is just outside Kington, with its wide collection of rare animals and birds, including its unique Owl collection. A great place for families to visit. For bookworms: If by some remote chance it happens to rain during your stay in Kington, there is a brilliant way of spending the time. Go to secondhand bookshops, and lose yourself for a few wonderfully self-indulgent hours! Take the road over the hills to the Wye valley. In Hay-on-Wye you will find dozens of them! Remember that at the end of May there is the week-long world-famous Hay Literary Festival, when this small town is invaded by eminent writers from all over the world who come and talk about their work.